Spring turns to Summer and all at once! The sun warms our skin. High numbers at training despite a large number negotiating the taper. London is on the horizon with nervous and excited conversations taking place on the build up to the big day! Saturday saw a record number of parkrun locations attended by club members. High temperatures resulted in huge numbers across the country, not least at one of our home locations. Some headed West to tackle inflatable obstacles and foam to earn their prize! 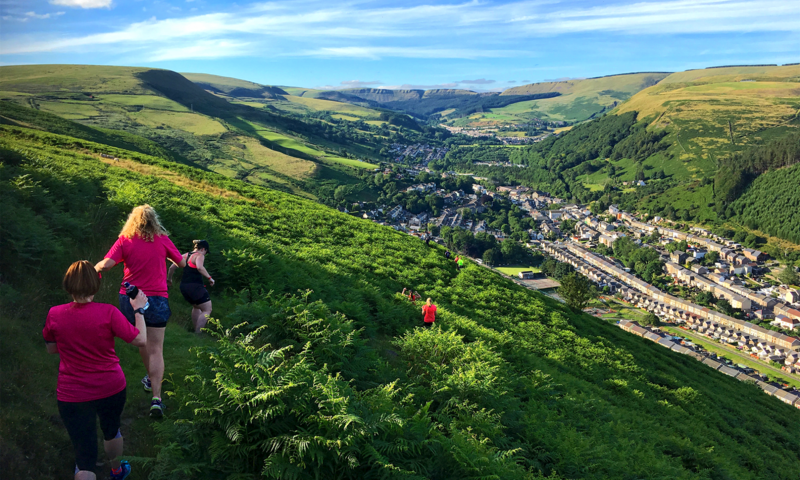 Some took advantage and headed north to Gilwern to tackle the infamous tough trail race with the almost vertical descent just before the finish. As we end the long weekend and start the short week we celebrate those in our midst who will be heading to the English capital next Sunday for the event that draws plaudits from all over the world. New and seasoned runners will be joining the ranks and supporting each other on their journeys! Training numbers again remain buoyant despite one of the nights being occupied by a number of Phoenix learning the final skills to be credited as endurance officials. Saturday arrives and parkrun is always there to occupy the time of many. Runners were out in force. 62 across multiple locations with the usual tourism still being prolific. Not just runners but volunteers also. A great Saturday! The sun sets and rises. One has made his way to our neighbouring European nation to complete another marathon in the French capital. Another headed overseas to a half marathon in beautiful surroundings with family members also making a significant impact! One made his way west to a sandy and very hilly half that proved to be a real test! Not quite as far west a huge number of volunteers joined runners to tackle two distances on the Millennium Path. Amazing performances all round with a club record tumbling in style! A very hilly marathon tested one in his training regime for bigger things. The trail session attracted an increased number of runners with new graduates continue to dip their toes into the “dark side”. The Phoenix out in force continuing their journeys – wherever they may lead. Attendance at training on the rise despite a big weekend looming! Magically the conditions improved as our brave souls headed out for their run!! The might Phoenix commanding mother nature? The usual parkrun frenzy was somewhat diminished because of other plans… bigger plans! 21 made an early start to their weekend lining up on Penarth Pier to make the long journey all the way along the coast to our namesake village. Their journeys would vary in time but all would give their all with true Phoenix spirit to achieve their goal… 33.5 miles. Big goal! An hour later many lined up on parkrun start lines at the usual variety of locations. As work is completed on the “beach” at Porthcawl the route returns to the lower prom – with a twist! Combined with celebrating 6 years of it’s running many donned superhero costumes for the birthday celebrations and a great time was had by all! Some of those taking on the shorter, but still immensely challenging, race along the coast made their way to the home of Gavin and Stacey to fulfil their parkrun fix before heading to Porthkerry Park to start their journey. Meanwhile, down west one lined with others to take on a brutal 13 (ish) mile adventure-run to take on undulating terrain, steep hills, icy river-runs and multiple sea-dips. Not for the faint hearted! Back on the coast volunteers gave their support and runners continued their journeys. 42 set off from Porthkerry Park start their homeward run… 18.5 miles – not to be sniffed at! Muddy paths of last year were forgotten and replaced with dry and hard surfaces… These are things that can’t be predicted! Bodies became weary. Minds were tested. As more made it to the end the party grew bigger…. … all waiting for the very last man to finish! Ultra marathon runners created at an event that continues to show true club spirit in every regard! The Phoenix rose high and soared over the South Wales Coastal Path for a day that will never fade from memory! One headed west to complete a route on the hills around Margam while another completed a 10 mile race postponed from earlier in the year. Long training runs were completed yet again ahead of the impending spring marathons. The Phoenix dared to dream. Throw open the doors as the sun rises and the aroma of early morning dew rides on the air. Spring is here. At last!! Spirits are raised for those who feel the heavy weight of the winter cold and darkness. Through these months we’ve remained strong. Outside our shared passion of putting one foot in front of the other we’ve shared our experiences to get through. And we got through! A night race attracted one to the east before the weekend arrived. Saturday. We know it’s coming. It’s inevitable. There’s no escaping it. You know how it goes… At 9am there’s always a start line that’s calling. Dotted up and down the country we got out there and did our stuff. Some still down under got theirs in before we’d even hit the hay. Of course, we’re not jealous! Honest guv. Mothering Sunday. We have lots of mothers in the club and we celebrate them all for their wonderful commitment to their families… After being celebrated by their own many joined other members to head to the capital to cover 6.2 miles around the Bay! 63 members laced up their daps and stood on the start line to cover the distance. With runners, volunteers and marshals from the club ranks it was a proper club outing. Clouds and a cool breeze greeted our runners but a plethora of PB’s were achieved and lots of smiles meant the slight downturn in conditions could not dampen their spirits. There are some events that stand out in the running calendar. The reason cannot always be quantified. Sometimes the magic just happens. A combination of cameraderie and support mix with the atmosphere of the day in a unique cocktail that bring the Phoenix together. It reminds us of the special bonds that bind us. it doesn’t have to be a long way. It doesn’t have to be really fast. We just have to share the experience, even if that’s from afar and just reading about it – we we still share in the endeavour. On a day that ends the club year and sees in a new one – we embrace the future on the back of a good day and look forward to it with enthusiasm and excitement! The reporting of a great year gave way to election of officers poised to give their precious time for the benefit of our members. Despite the cancellation, training numbers were high on the remaining days! A huge turnout across the board. A club record of 80 parkrunners. The largest contingent down on the seafront for their Saturday morning constitutional. More heroes graduating from the programme with honours and filling us with pride! Some took it to extremes as, yet again, a location down under sees the Phoenix completing their requisite 5k. One of our number who works within secure walls completed his while working. One in the Emerald Isle while several crossed the border to England to complete theirs. All contributing to a new benchmark to beat! Spring well and truly announced itself as sunshines burst through the curtains from early with clear blue skies! The Taff Trail hosted two of the events spread far apart. The most local in the Welsh capital saw several clock up decent times. Further up the valley others showed spirit to help fellow fallen runners to reach the finish line! Even further up the valley one looped several times to rack up another event toward their challenge goal. One chose an event advertised to break the soul, but reported back victorious – soul still intact! A couple ventured to central England, to the town named for it’s span of the River Severn to notch up another half! Some headed up to circumnavigate the English capital with impressive half marathon results. One, renowned for a pacing role, held excellent time in warm foreign climes with a tick for another job well done! A glorious forest backdrop promised great things for our runners and delivered with impressive times but saw one of our number fall with an admission to hospital. The Phoenix rally to send support and love for a speedy recovery. Team spirit. The sea front across the channel from us beckoned a few away for the weekend and saw impressive results from another inaugural half. Others did their own thing, sharing long runs in the build up to the traditional spring marathons that are fast approaching. Our run leaders stayed loyal and delivered sessions to those with nothing on the calendar. A trail running taster proved popular wooing members over to the “dark side” quickly from their first experience. Training, racing and sharing memories together. The shared excitement at the achievements of others. The shared concern for those who are struggling, physically or otherwise. We are here for each other. Always. We didn’t have to boldly go where no man has gone before but we did head to Porthcawl in numbers. Some drove, Some ran. Some ran a long way to get there. Supported by other members record numbers were in attendance. 8:50am they had their briefing. Nervous but with brave faces they lined up. All defeated the elements and finished victorious and celebrated with cake. The café full to the rafters as they reviewed their achievements. Other locations were also visited with a couple notching up their 100 milestone while completing yet another tourist destination. Focus shift for the afternoon with many shirking any miles to watch the rugby with Wales standing proud in claiming the prestigious Grand Slam. Sunday arrives and some headed over the bridge to complete a half around a historic city with impressive results. A large group headed up the valleys to enter an event with two distances with great running all round. A small but perfectly formed group went west to run and vulnteer to fulfil our final commitment in a cross country league. Long training runs were completed with valour as the spring marathons approach. We gained a Coach in Running Fitness as one committed member completed the course to join our expanding team. A lot to look back on and celebrate this weekend. A lot for us to be proud of. Keep up the good work team. New to Japan we’ve even learnt it’s all one word, lower case in English in any written language! Whatever your ability, you’re welcome. One of our number celebrated with her husband at our home up the valley on a wonky route that drew many along to celebrate. Cake, of course, was shared by many there. Our other home saw a small number graduate as fully blown heroes from our development programme to celebrate on crossing the finish line. Friends and family came along to cheer them along with many club members in attendance. Others travelled far and wide, and I mean WIDE! Four countries, England, Wales, Ireland and Australia! We don’t do things by half – Phoenix not only flying high but also Long Haul! Some targeted new locations while others ran wherever they’d laid their hat, or was it a tourist cowl or bob! Some not happy having done 5k in the morning headed west. Starting as it got dark they ran around some woods avoiding the wolves and steered by map and torchlight to seek out hidden numbers in teams of two. Admirable performances all round with one team successful in their quest. Fun was had by all even if some got lost in the process! The Grizzly. 20-ish miles as advertised. Tough, as advertised. One of our trail aficionados made his way south to stand on the start line as the Beast from the East stopped play a year ago. Cobbled beach, mud, climbs, descents and numerous other challenges en route to make this a real test. The Phoenix rose and conquered The Grizzly! Cosmeston. Tranquil and serene. Until Storm Gareth wades in and high winds whip across the water and cause concern of danger in the woods leading to a shortened course. Our intrepid runners still battled their way from start to finish line. Multi-sport. We bow down to those who combine their running with other disciplines. One, having escaped the wolves the night before, took to the water first and ran to complete her combined event with impressive results. One fled north. Snow and extreme cold provided extra challenges to the storm that raged. Not only was the distance completed but a personal best time was the outcome! The English capital and the Big half was the attraction for one. As training leads up to London in a few weeks time for a longer distance the run resulted in another personal best time! A few went a few miles down the road to battle the elements around a varying number of small loops to notch up times at varying distance. The elements threw challenges in the way but all reached their goals and came away with their prize! While all this was going on our heroes headed down to the sea front. Gale force onshore winds battered them on their way to the turnaround as they prepared themselves for their graduation next week. They were not defeated and they are ready! Training numbers on the increase again. Phoenix friends join forces to support each other on training runs outside of those planned. We all struggle – and when we do we come together to be that shoulder, to be that ear, to be that rock. When all else fails, those wings are spread and we catch each other when there’s a chance we will fall. What lessons have we learnt? The elements have tested us and we rose to the challenge and stand firm. Victorious. From those starting their journey to those hardened to the task. We say goodbye to another week and enter a new month! Spring marathons draw close and excitement builds but long runs are still essential and we see members sharing company to ease the burden as they build up to the big ones. The local event by the sea saw significant milestones. A double century of volunteering for one and 250 events for another while celebration of Dydd Gŵyl Dewi Sant brought many out in traditional attire. As always at our second home event volunteers and runners met up the Llynfi Valley to complete the necessities. Inaugural events and tourist destinations in abundance but all within the British Isles this week! A group made their way up the Garw Valley to command respect from the Gollum. Not running, but walking. Respect to those who are injured and cannot raise the pace. A healthy group circumnavigated the route and reported back gaining a great deal from it. Our walkers thrive. We’ve hit that scenario again. Saturday racing. For some that means sneaking in a parkrun first. As you do. A tough hilly course in Mid Wales covering 30km around some lakes saw several battle the elements to the finish, all of them victorious. The dramatic Pembrokeshire coastline attracted a few to complete a brutal, exposed race of half and full marathon distance. The high storm winds whipped up to challenge their stability on the narrow cliff-top paths. All finished safely and clutching medals with pride. Junior and senior competitors crossed the border to run on grass by a castle to represent the club in the last event in the cross country league. Newport was the destination for a brave bunch challenging the elements for a half distance. All did amazingly well with personal bests recorded for those who pushed it. Many turned up to continue their journey to becoming heroes in spite of mother natures challenges while our trail group continue their trip along a section of the stunning South Wales coastline. Moving out of winter we often see conditions worsen before they improve. We’re not adverse to storms of late and in spite of what they throw at us we still hit the streets to complete the miles. It’s often at times like this that we look out of the window and decide to stay put. It’s the brave and determined that open the door, step out onto the street with their daps on and battle the worst that mother nature can throw at them. Be brave, but always remain safe! A lot of you showed you are. This month saw 216 parkrun finishes by 108 different members across 25 different parkrun venues. As well as the usual South Wales parkruns, tourism included Seaton, Bath Skyline, Burham, Ellesmere Port, Old Deer Park, Gloucester North, Bideford, Kingsway, Telford and Exmouth plus some further afield which I’ll come onto next. Tim and Philippa Rees returned from Australia but not before completing Lake Entrance parkrun taking Tim’s total number of Aussie parkruns to 14 across 7 different venues whilst Philippa did 12 across 7 venues. With Philippa only recently having started parkrunning, 12 of her 14 parkruns have been in Australia and she’s already visited 8 different venues. Interestingly, Chris Roberts, Martin Beard and Kaye Pedler have also done parkruns in Australia with each one being a different venue so in total, there have been Ogmore Phoenix Runners at a massive 18 different Australian parkruns. Now you may have missed this (although if you have any social media then I think you’ll probably have seen a post or two) but 7 members of our club went to Jersey just to do a parkrun. Led and organised by super tourist Karl Johnson, some chose to stay in London the night before whilst others got up at 130am to travel to London to then get a flight to Jersey, do the parkrun, and make the return leg that afternoon. Well done to the crazy gang of Aled, Steven James (who had only done one other parkrun prior to this), Dawn, Karl, Chris Stanlake, Rhiannon Sian and James Beynon. The crazy parkrun tourism continued with Jo Gamba and I going to Delaware and Raritan Canal parkrun in New Jersey. It was the nearest parkrun to where we were staying in New York but still required about an hour and half of travel time. I finished 3rd overall whilst Jo was first female finisher for the first time in her 124 parkruns. If you want to read more about this, I did a lengthy post about the event on our Facebook page if you wish to read more about it. This month saw Debbie Bennion and Richard Purnell celebrate their 50th parkruns. Some highlights in month included Ben Davies, Sian Jenkins and Chris Bimson all notching up two PB’s each, yet another PB for Claire Taylor, Shawn Cullen bagged himself a PB, plus many more. At the super speedy end, Aled Hughes and James Littlewood both ran 19:15 PB’s at different locations on the same day, whilst returning member Chris Truman smashed his previous best with a 19:28. Niki Puleio was first finisher at Maesteg for the first time since September whilst Dawn Hopkins was first female finisher at Elsmere Port. The month kicked off with a couple of very different 10K events. Emma Morris completed the London Winter 10K in 51:45 through the parks and streets of London whilst Dawn Hopkins, Chris Richards and Adrian Pearce took on the Worms Head 10K. A multi terrain race near Rhossili Bay with over 800 feet of elevation. This was Dawn’s 11th event for the club in just 34 days and a day after being part of the crazy gang who went to Jersey parkrun. Emma was back in 10K action again later in the month with the Castle Combe 10K in which she came in just under 1 hour. Our final 10K of the month was the Pontypool 10K where Karl Johnson was our first member across the line followed by Liz Davis, Shawn Cullen with another PB, Debbie Bennion, Julie Ransom with a PB time, and Sharon Pritchard. A tough course which goes to show the improvements by Shawn and Julie recently with them managing PB’s there. Shawn Cullen ran the inaugural Cardiff 10 mile event where he smashed his previous PB with a 1:33:23 just 24 hours after getting a parkrun PB at Gloucester North. There aren’t too many 10 milers about so this should definitely be one on peoples lists for next year. Darija ran the Ras Cors Caron Half Marathon in 2:30:24 despite being out for Presentation night the previous evening. The big Half Marathon this month was the Llanelli Half Marathon which had 47 Ogmore Phoenix Runners in attendance as well as several volunteering and many more supporting. Ryan Evans ran 1:27:42 despite having not run much over the Winter, Chris ‘Wonka’ Williams was next up with 1:36:30, before our first PB of the day with Keith Coleman running an impressive 1:41:30. The PB’s continued with a 1:44 for Gareth Davies and Claire Dunbar Bowen became only the 3rd female member to go sub 1:45. A long list of PB-ers were to follow with Gregg Harris, Craig Alexander, Sian Thomas, Shawn Cullen, Hannah Bartle, Natalie Aryal, Ken Salvatore, Rhiannon Sian, Hannah Knight, Rosaleen Lian, Kerry Worthington, Helen Griffiths, Shelley Evans, Claire Taylor, Michelle Alexander, Rhiannon Lewis, Louise Bennett and Leanne Parsons. Some remarkable achievements in amongst those including Claire Taylor now having knocked over an hour off her Half Marathon since joining the club, and Shawn Cullen becoming one of the first members ever to record 4 PB’s and 4 different distances in the same month… in fact, it was 4 over the course of 3 weekends. Jo and I also ran the Central Park Half Marathon whilst in New York. We ran together finishing in 2:12:11. Again, I did a lengthy post about the race on our Facebook page if you wish to read more about it. Nick Harris and Simon Melksham ran the 3rd event of the Chepstow Night Race Series. A 5 mile event with over 800 feet of elevation. There were 5 club finishers in the Dursley Dozen which was the 2nd race in this years Trail Championship. Adrian Pearce led the runners home followed by Steven James, David Sheard, Emma Loyns and Bev Sheard. We had 4 runners at the Brecon to Cardiff Ultra. Kris Denholm completed the 44 mile course in 8 hours and 6 minutes with Gareth Richards a few minutes behind. Dan Clark completed his second Brecon to Cardiff in 8:40 knocking 50 minutes off his time from 2018. Wayne Hayhurst completed our Ultra finishers in 9 hours 40 minutes. February also saw the first event of the Club Road Championship. I set our runners the challenge of completing the regular 5 mile training loop from the Life Centre in Ogmore up to the top of Nantymoel and back down and around… twice. A challenging 10 miler with almost 1000 feet of elevation, although it should also be pointed out, a significant amount of miles downhill. 36 members took on the challenge with Niki Puleio clocking the fastest time of 1:07 whilst Sarah Littlewood was the fastest female with 1:26. The next event in the club championship is the Cardiff Bay 10K on March 31st. Celebrating the achievements of the club and its members during 2018 , the Presentation Night was held at the Richard Price Centre on Saturday 16th February. The night kicked off with a speech from our Chairman, Chris Pratt, followed by an hour long video containing photos and short video clips of the year – over a 1000 in total. The awards followed with Tammie Baker winning the top prize of Runners Runner after a fantastic year including huge improvements from 5K to Half Marathon (which also saw her win the Most Improved Female prize as well). The next batch of awards listed are based on the fastest times by a runner in that category over the ‘standard’ distances of 5K, 5 miles, 10K, 10 miles, Half Marathon and Marathon. Whoever has the most ‘fastest in category’ wins – it’s a simple as that. The Club Runner is then chosen by the awards panel (made up of committee members, captains and myself as stats guru) from the 6 category winners. The Age Grade Championship included fastest times (and corresponding age category percentages) at Maesteg and Porthcawl parkruns as well as age grade percentages for each of the 6 Bridgend League events. The inaugural Trail Championship included multi terrain races spread out across the year which included everything from short fell races to Bridgend League to 10+ mile multi terrain events. Best Newcomer doesn’t really need much explaining. Basically anyone who has been in the club for less than a year and have made a big impact which could be a combination of time improvements, events run / representing the club, volunteering and encouraging others. Most improved is one of the trickiest to decide as there were so many worthy contenders. From those who’ve been running for years and working hard to chip away a few seconds, to those knocking several minutes off as they start their running journey’s, and everyone in between. The criteria for the Zero to Hero award is simple – someone who started through attending Zero to Hero, and like Best Newcomer, has shown improvement in times and / or volunteered and represented the club. For those that don’t know what this assuming moment is – Matt Murray (selfie extraordinaire) managed to catch Alica popping her head up from behind a wall after a ‘call of nature’ stop in the middle of Snowdonia Marathon. Photo of the year was actually a series of photos put together of Aled falling over in a river during the Merthyr Mawr Pudding Run as he was busy looking behind him and no doubt ‘gently encouraging’ in his Aled sort of way to catch up. There was also recognition of the top 10 male and female finishers in the Trail Championship and a list of everyone who got a vote for Runners Runner. Another brilliant evening organised by the social committee and huge thanks to them on another successful evening. That wraps up my review of another busy month for Ogmore Phoenix Runners. Over to Chris for his choices for Chairman’s Runner of the Month. Spring is in the air. Warmer weather and the build up to the spring marathons. Miles have been trod through the cold and miserable winter months and the long runs are being completed by those nearing the finale. My first choice is one such person. If you told someone they’d be tackling a marathon in a few months time, let’s say 6 months time, you’d often see either an initial excitement or fear. One might lead to overtraining and subsequent difficulties. The other might lead to ignorance and lack of training that also lead to difficulties down the line. I think it’s fair to say this was never an intentional pathway for one. A position in a prestigious event was bestowed upon one which resulted in a combination of the latter scenario coupled with denial. However, the resulting actions have not been the characteristic lack of training it has been a complete change of lifestyle. Renowned for loving to eat out and a tipple or two he has completely reformed. Eating well. Cut out alcohol. Training like a demon… and I mean a demon! Regular yoga and spin classes. Getting out for the required runs according to plan – but also being mindful of his body, which is exactly how it should be. When it doesn’t feel right, easing back. Not only are the miles building, but the times are coming down naturally. The weight is falling off which often leads to natural improvements, but when combined with a good training plan the improvements are accelerating. PB’s left, right and centre. Four at four different distances over three successive weekends. This is a disciplined approach that you cannot help but admire and celebrate. I have absolutely no hesitation awarding my Male Chairman’s Runner of the Month to Shawn Cullen. This is the first time I’ve awarded a runner of the month to the same person twice and it won’t happen very often, but this month’s efforts were something which cannot be overlooked. Keep it up Shawn – it’s a mightily impressive way to tackle marathon training for the first time! I have said in the past many times that this is more than just running. As a club it’s something we celebrate. Not only do we run, but we also volunteer for many things – usually associated with running. The month started with some of our number away in foreign climes. For two it was in extreme heat about as far from home as they could possibly be on the other side of the world. Despite the heat they managed to find opportunities to run thanks to parkrun. Indeed, at several locations whilst away on their travels visiting family. We enjoyed the stories of each one reported back via social media. Many of stories told of battling with the heat in normal everyday life, but making that extra effort to head out of the door to actually run in it every week is fantastic! On immediate return one of them had volunteered to man a water station at Llanelli Half and dutifully turned up ready to do so. It’s no mean feat standing in the cold handing out bottles of water but when your body has been subjected to incredibly hot temperatures for an extended period of time it’s an extra shock to the system. Not only that but when a runner arrives at the water station and is feeling unwell and collapses the nursing instinct took over and she lay down alongside said runner to shield her from the strong and very cold onshore breeze for half an hour putting herself at great risk from the elements. Above and beyond the call of duty, but instinctive. Rest assured, I’ve discussed this with her since and she realises how risky it was for her but doesn’t recognise the adulation that it attracted as it was just such a natural thing for her to do. I totally get this, but it is worthy of praise because it demonstrates an extraordinary natural kindness of spirit. Going above and beyond the call of duty to help others. Something worthy of commendation. I am delighted to announce my Female Chairman’s Runner of the Month as Philippa Rees. After the highs of presentation night last weekend, things return to normal in the Phoenix family. Some headed up to our spiritual home to complete a double loop in anticipation of securing a team place or simply to satisfy a requirement of the club championship. The weekend was soon upon us with the usual start to the day at 9am. The ritual that is parkrun. Big numbers spread between the two home locations while others headed further afield. Two a bit further than most completing their 5k around a course on the east coast of America. Sunday dawns and a few head up to the land of the Poolers to complete a 10k route in spring-like conditions as the weather takes a decided turn for the better. Our two friends abroad headed to the Big Apple. The park in central Manhattan was the venue for a half marathon which no doubt was a spectacular event to be a part of! A relatively light week of racing but huge numbers are still getting out there and getting their training done or popping along to parkrun. Many ease into the long miles in spring marathon training plans and report back how they’ve completed them in style! Spring seems just around the corner as temperatures rise and the sun shows its face accompanied by positivity!